dominKnow | ONE offers all the features of a Responsive eLearning Authoring System together in one solution, allowing your Content Authors to work collaboratively to rapidly create engaging learning content. 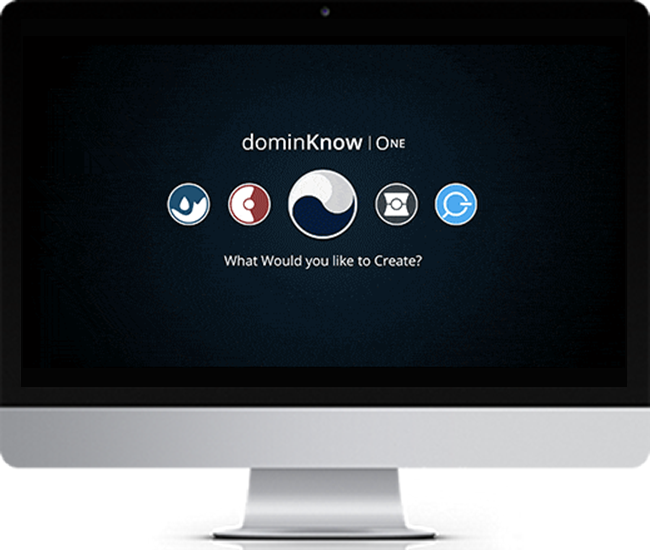 With dominKnow | ONE you can create multiple types of eLearning content for use on any device. Bringing together traditional eLearning course development with powerful responsive eLearning authoring and built-in software simulation means that you need fewer tools to build more kinds of eLearning, faster. 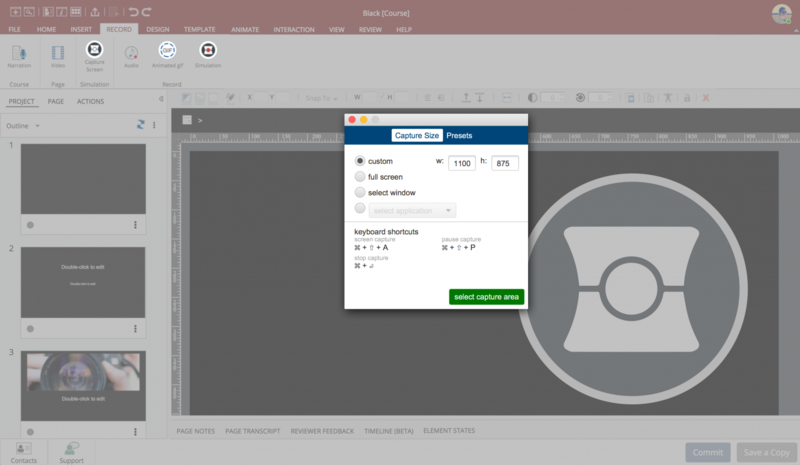 Templates, stock assets, a central library to share and re-use content across projects and real-time collaboration and review provide all the capabilities you need for rapid authoring. The Flow mode within dominKnow | ONE enables you to create multiple types of responsive eLearning content without sacrificing functionality and user experience. Automatically adapting content to every device, Flow creates truly responsive eLearning, so you only need to author once for all devices. 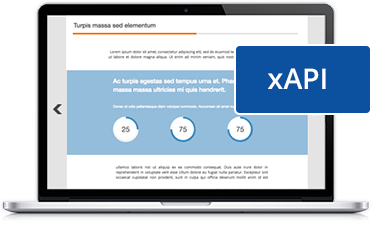 If your content doesn’t need to be responsive, the Claro mode allows you to create traditional HTML5-based eLearning courses which will still adapt and scale to fit any size screen. Flow outputs adaptive and fully responsive eLearning content so you don't have to worry about specific devices or multiple versions of the same content. Claro courses are designed for a fixed layout, but are HTML-5 based and scalable for viewing on laptops and desktop computers as well as mobile devices. Use Capture to create cross-platform, software simulations for stand alone use or integration with other learning content. Pre-created themes, templates and layouts allow you to easily get started and quickly create engaging and visually appealing content. There is also a library of pre-loaded stock photos, characters, icons and shapes to choose from. You can quickly and easily convert existing PowerPoint files into engaging eLearning courses and import Word files, including images. dominKnow | ONE offers a complete authoring toolset that is easy to use and powerful for advanced users, with no programming required. Fully customisable practise and test questions allow you to check for understanding in your eLearning courses. Multiple question types are available which can also be randomised using question banks. Your content can also incorporate audio narration, music, animations and interactive video, as well as images. dominKnow | ONE comes integrated with a powerful and responsive simulator app that allows you to easily incorporate software simulations, screen captures and animated GIFs into your eLearning courses. You can edit the recorded Capture steps and add audio. Simply drag and drop your completed Capture recording onto your content page and set it to behave as an animated “Show Me”, an interactive “Try Me” or a list of guided steps. 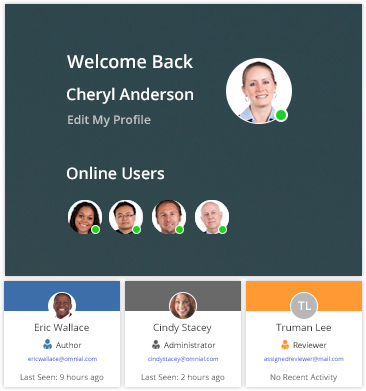 dominKnow | ONE includes built-in collaborative workflow and review tools allowing you to manage, track and report on your eLearning projects. All team members can work simultaneously on the same project with functionality that allows you to see version history, who has made changes, as well as review and provide feedback. A central media library stores and tracks all your assets in one location so any team member can share, re-purpose or re-use content. The roll back feature in dominKnow | ONE allows you to revert to an earlier version of your content if a mistake has been made. And because everything is automatically saved to the cloud, there is no worry about losing your content. Themes can be utilised to manage and maintain brand consistency, ensuring all your authors are using up-to-date content and allowing you to update the theme for multiple courses in one simple step. Publish your dominKnow | ONE eLearning as SCORM, xAPI, AICC, Web or Print and use PENS for one-click uploading into your Learning Management System. dominKnow | ONE is the only authoring system that automatically generates xAPI statements for almost any action your learners take. This enables you to easily leverage better data from a wider range of learner experiences. Connect to one or more Learning Record Stores (LRS) in a few simple steps. dominKnow | ONE meets guidelines for WAI-ARIA, WCAG AA Level 2.0 and Section 508 Compliance, ensuring that you can author eLearning that is accessible to everyone. 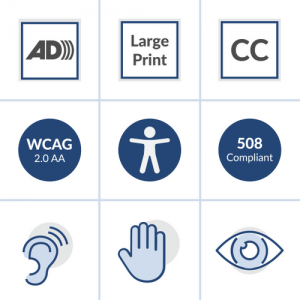 This includes elements such as text and focus, audio or video transcripts, closed captioning, language ID for screen readers and WCAG compliant themes. 1. Clone any course and choose from over 50 pre-loaded languages that automatically update system text and course interface for things like tool tips and navigation. 2. Export text as an XML or Excel file for any common translation system. 3. Import translated text back into your cloned course. You can preview the ‘parent’ course whilst working in your translated version and see all versions of a translated course when browsing your courses. Your content remains linked to the parent course for simple future updates across all versions. Larmer Brown offers services and support to ensure your content authoring team achieves maximum benefit from dominKnow | ONE. This includes training, content development services, implementation and technical support, as well as a QuickStart programme which gets you up and running fast.